2.5" Square up a half-square triangle in less than half the time. No more "ruler rock" with Bloc_Loc. The patent pending channel locks onto the seam and slides to make a perfect square cut every time. 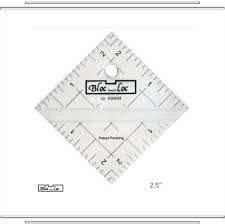 All Bloc_Loc Half-Square Triangle Square Up Rulers have fine, solid lines every 1/2" which makes trimming more accurate!